The Snake River is a major river in the United States located in the greater Pacific Northwest. It is the ninth longest river in the country with a length of 1,735 kilometers. It is the largest tributary of the Columbia River. The drainage basin of this river is the tenth largest of North American rivers. It covers almost 2,80,000 square kilometers. The river rises in western Wyoming and forms the border with Oregon and Idaho and the border with Washington and Idaho. There are a total of 15 dams built on this river for a multitude of different purposes. The drainage basin of Snake River covers parts of six U.S. states which are Idaho, Nevada, Wyoming, Oregon, Utah and Washington. The Lewis and Clark Expedition was the first American expedition to sight the river. This river was explored by Europeans for the first time as part of the Canadian fur trade. Approximately 274 bird species call the Snake River watershed their home. This river flows through a gorge 1 mile or more deep. It is known as Hells Canyon, the deepest river gorge in North America. This canyon area was once home to Shoshone and Nez Perce tribes. It is an important source of irrigation water for potatoes, sugar beets, and other crops. There are more than 20 major tributaries and most of them are in the mountainous regions of the basin. Shoshone falls also called the Niagara of the west is a waterfall on snake river. Declan, Tobin. " All Facts for Kids about Snake River ." Easy Science for Kids, Apr 2019. Web. 24 Apr 2019. 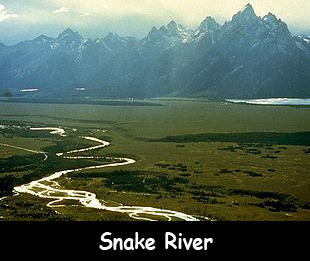 < https://easyscienceforkids.com/snake-river/ >.